It is time to plan for the 2001 convention of the National Federation of the Blind. This year we will be gathering in Philadelphia, the city of brotherly love and home of the Declaration of Independence and the Liberty Bell. It will be a memorable place for celebrating the Fourth of July. We will again enjoy the hospitality of a Marriott hotel. 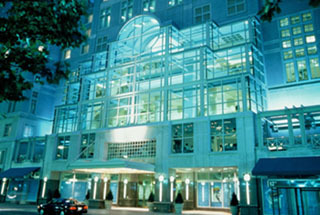 This one is the Philadelphia Marriott, and from all reports it is beautiful and beautifully appointed. Once again, our hotel rates are the envy of all. For the 2001 convention they are singles, $55and doubles, twins, triples, and quads, $65. In addition to the room rates there will be a tax, which at present is 14 percent. There will be no charge for children eleven and under in the room with parents as long as no extra bed is requested. 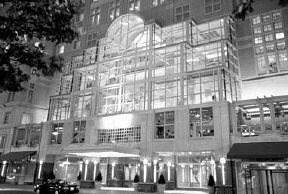 For 2001 convention room reservations you should write directly to the Philadelphia Marriott, 1201 Market Street, Philadelphia, Pennsylvania 19107, or call (215) 625-2900. Marriott has a national toll-free number, which for the first time ever you will be able to use to make your room reservations. This number is (800) 228-9290. The hotel will want a deposit of $60 or a credit card number. If a credit card is used, the deposit will be charged against your card immediately, just as would be the case with a $60 check. If a reservation is cancelled prior to May 29, 2001, $30 of the $60 deposit will be returned. Otherwise refunds will not be made. The Philadelphia Marriott has 170,000 square feet of meeting space and more than 1400 rooms on twenty-three floors. Guest-room amenities include cable television, coffee pot, iron and ironing board, hair drier, and dataport. You will also enjoy a health club, indoor pool, sauna, and whirlpool. The usual valet service is available, but a self-service laundry is also on the premises. Three of the four excellent restaurants will seem familiar, though even better, to those who visited the Marriott Marquis in Atlanta: Allie's American Grille, open for breakfast, lunch, and dinner; the J.W. Steakhouse, open for dinner only, and Champions Sports Bar with snacks and relatively light fare late into the evening. Starbuck's is also on hand providing light fare and good coffee at all three meal times. See later issues of the Monitor for information on tours and other outings into the Greater Philadelphia area. The 2001 convention of the National Federation of the Blind will be a truly exciting and memorable event, with a program unparalleled, an exciting city to explore, and a rededication to the goals and work of our movement. Make plans now to be a part of it. The schedule this year is close to our usual one. Pre-convention seminars for parents of blind children and other groups and set-up of the exhibit hall will take place on Sunday, July 1, and adjournment will be Saturday, July 7, at 5:00 p.m. Convention registration will begin on Monday, July 2, and both Monday and Tuesday will be filled with meetings of divisions and committees, including the Tuesday morning annual meeting of the Board of Directors of the National Federation of the Blind, which is open to all. General convention sessions begin on Wednesday and continue through the afternoon of Saturday, July 7. The annual banquet will take place on Friday evening, July 6. To assure yourself a room in the headquarters hotel at convention rates, you must make reservations early. The hotel will be ready to take your call or deal with your written request by January 1. Remember that as usual we need door prizes from state affiliates, local chapters, and individuals. Once again prizes should be small in size but large in value. Cash, of course, is always appropriate and welcome. As a general rule we ask that prizes of any variety have a value of at least $25. Drawings will occur steadily throughout the convention sessions, and you can anticipate a grand prize of truly impressive proportions to be drawn at the banquet. You may bring door prizes with you or send them ahead of time (identifying the item and donor and listing the value in print and Braille) to NFB of Pennsylvania, 42 S. 15th Street, Suite 222, Philadelphia, Pennsylvania 19102-2206. The best collection of exhibits, featuring new technology; meetings of our special interest groups, committees, and divisions; memorable tours arranged by the host Pennsylvania affiliate; the most stimulating and provocative program items of any meeting of the blind in the world; the chance to renew friendships in our Federation family; and the unparalleled opportunity to be where the real action is and where decisions are being made--all of these mean you will not want to miss being a part of the 2001 National Convention. We'll see you in Philadelphia in 2001!